Taipei, Jan. 8 (CNA) The island county of Kinmen on Monday slapped a fine of NT$200,000 (US$6,486) on a visitor for the first time since the penalties were raised late last year for bringing meat into Taiwan, according to a Customs officer. Kaohsiung Customs officer Lai Heng-mao (賴恒茂) said Tuesday that the NT$200,000 fine was imposed on a Chinese tourist, who was attempting to enter Kinmen by sea with 0.4 kilograms of sausages. The sausages were seized at Shuitou Pier and handed over to the Kinmen Inspection Station, a unit of the Bureau of Animal and Plant Health Inspection and Quarantine (BAPHIQ), Lai said. Since the fines were increased Dec. 18 last year amid fears over African swine fever (ASF), more than 45 people have each been fined NT$200,000 at various ports in Taiwan for attempting to bring meat products into the country in violation of its laws, according to BAPHIQ data. Monday was the first time, however, that a visitor entering at a Kinmen port was hit with the NT$200,000 fine, Lai said. 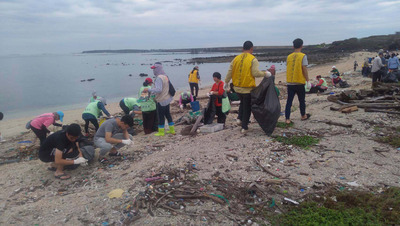 Last week, two pig carcasses were found along the shoreline of Kinmen, one of which was confirmed on Jan. 3 to be infected with the ASF virus. Since then, quarantine measures have been tightened in Kinmen, which lies less than 10 kilometers off China's coast, to include a two-week ban on the shipment of meat products to Taiwan proper. According to Kaohsiung Customs, the risk of ASF being spread by visitors bringing pork or pork products into Kinmen from China is extremely high in light of the volume of passengers traveling between the two sides and the fact that the trip takes only 30 minutes each way by boat. The efforts in Kinmen to prevent the entry of the ASF virus include tighter quarantine measures and luggage inspection, as well as public announcements warning incoming passengers not to bring in pork or pork products from mainland China, Kaohsiung Customs said. Since the first confirmed case of ASF was reported in China's Liaoning Province last August, Taiwan has been on high alert, worried that the spread of the virus would devastate its NT$80 billion-a-year pig farming industry. Currently, there are about 11,000 pigs on 68 farms in Kinmen, according to the Council of Agriculture. The government on Dec. 18 increased the fines for bringing in pork products from countries with ASF outbreaks, with first offenders liable to be fined NT$200,000 and repeat offenders NT$1 million.